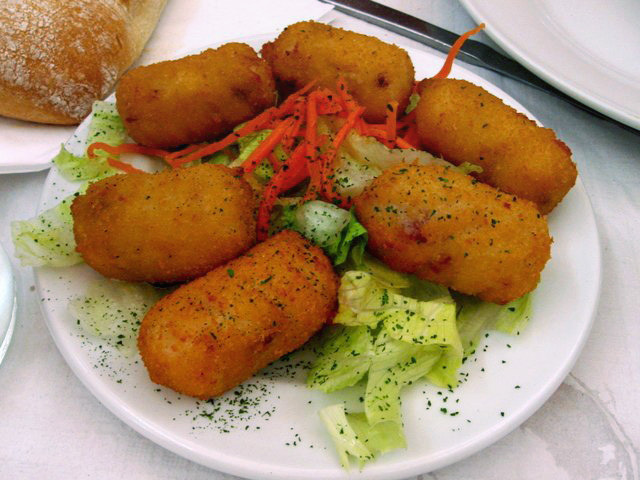 Croquetas are one of Spain’s most popular tapas which appear on menus all over the country. Make sure they are ‘Croquetas Caseras’ (home-made) before ordering as there are too many places these days serving up croquetas from a plastic bag in their freezer which they bought at the local supermarket. The fresh ones are so much better. In this particular recipe I’ve explained how to make ‘Croquetas de Jamón’ which involves making a béchamel sauce containing Serrano ham. There are, however, many variations on the Spanish croqueta which you could equally stuff with prawns, fish, boiled egg, chorizo or chicken. Familiarise yourself with making this recipe then you can experiment with all kinds of variations further down the line. This is a dish that requires a fair bit of preparation before the final cooking process begins. In fact, this first part is best done the day before you plan on eating the croquetas. Begin by adding a little olive oil to a shallow dish in which the sauce for the croquetas will be left in the fridge overnight. Set this aside for the moment. Now gently heat up a saucepan containing two tablespoons of olive and melt the butter into it. It’s crucial that you keep the pan at a medium temperature so as not to burn the butter. Now start to slowly add the flour, stirring constantly to prevent any lumps developing until you have a smooth texture. This shouldn’t take more than a couple of minutes. At this point you add half a cup of milk and increase the heat under the pan until the mixture begins to boil. Now add the remainder of the milk and begin stirring the mixture until it starts to thicken. It is crucial throughout this stage that you do not stop stirring otherwise the mixture will go lumpy and completely destroy the dish. Once you’ve created the desired consistency you must lower the heat to medium and allow the mixture to continue cooking for a further ten minutes whilst you continue to stir it. At this point you should have a lovely béchamel sauce. Now you add the jamón serrano which has been chopped into tiny pieces and stir it through your sauce consistently. You might add a little salt at this stage but that will depend on how salty your jamón serrano is. After no more than a minute you can stop cooking and pour your mixture into the dish which you set aside before preparing the sauce. Now just leave your béchamel sauce uncovered until it is cool enough to go in the fridge, cover it and leave it in there overnight. You could get away with the mixture going in the fridge for just a few hours but overnight is preferable. Now break the eggs into a bowl and use a fork to whisk them to a smooth consistency. Pour all the breadcrumbs on to a dry plate and spread them out evenly. Take the béchamel-jamón sauce out of the fridge and use two tablespoons to scoop up some of the mixture and mould it into the shape of a croqueta. It’s often easier at this point to use your fingers to get them just right. Once all the mixture has been used up and you’ve made all your croquetas you need to gently roll each one in the breadcrumbs and dip it into the egg mixture before rolling it a second time in the breadcrumbs. Finally, place all of them on a plate (not touching one another) and put them in the fridge for about half an hour. Frying takes place at a very high heat for about two minutes or until each croqueta is golden brown all over. You can cook them in several batches ensuring that they are completely covered by the oil. It’s best to remove them from the pan with a slotted spoon, allowing any excess oil to fall back into the pan before transferring them to a pre-heated oven where they can be kept warm at a medium temperature whilst you cook the next batch of croquetas.